Absolute Adventure offers Kayaking and Stand Up Paddle Boarding in the UAE and Oman. Whether you are looking for a half day introduction or a multi-day expedition, we have a trip for you. At the Kalba watersports center, you can kayak or SUP on a shallow, protected lagoon while observing the unique mangrove habitat with a chance to see endangered animals like the turtles and crabs. The mangrove forest is also a bird watching paradise and is home to the endemic Arabian White Collared King Fisher. In Dibba, we have access to many kilometers of wild coastline dotted with isolated beaches, dramatic cliffs and caves. 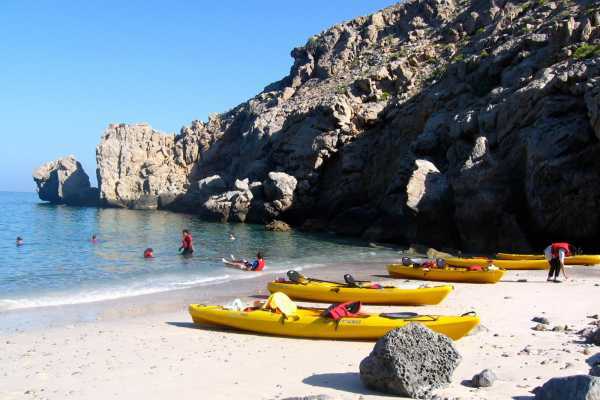 While kayaking along the coast, we have the opportunity to snorkel, relax on the beach or, even try some cliff jumping! For a great family day out, dhow cruises along the Dibba coast are available every Friday. From AED 519.75 Half day sea kayaking along the spectacular Musandam coastline. Paddle from Zighi Bay and explore the rugged coastal cliffs to the north of Dibba. We'll stop at an isolated beach for a break and some lunch before continuing the paddle back to Zighi Bay. Good fitness is required for this 3-4 hour journey. 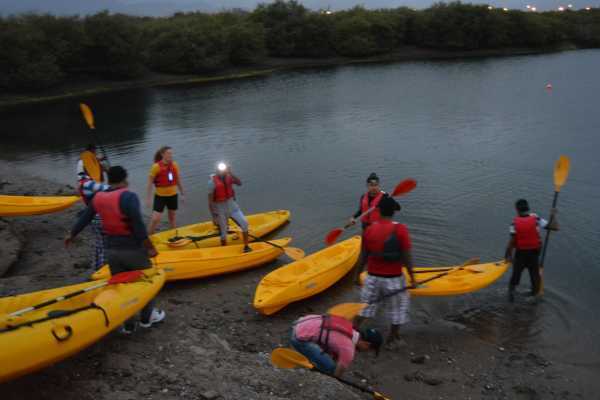 From AED 309.75 This paddling trip in the Kalba Mangroves is perfect for the wildlife enthusiasts. The mangrove environment is home to loads of birdlife including the endangered, Arabian White Collared Kingfisher. You're also likely to spot Green or Hawksbill sea turtles, endangered crabs and a variety of fish. We'll Paddle under the light of the full moon, the views are incredible. From AED 309.75 This paddling trip in the Kalba Mangroves is perfect for the wildlife enthusiasts. The mangrove environment is home to loads of birdlife including the endangered, Arabian White Collared Kingfisher. You're also likely to spot Green or Hawksbill sea turtles, engangered crabs and a variety of fish. We'll paddle about 2 hours, the views are incredible. From AED 309.75 This paddling trip in the Kalba Mangroves is perfect for the wildlife enthusiasts. The mangrove environment is home to loads of birdlife including the endangered, Arabian White Collared Kingfisher. You're also likely to spot Green or Hawksbill sea turtles, engangered crabs and a variety of fish. We'll start paddling about 1 hour before sunset which is an ideal time for wildlife spotting and the views are incredible.